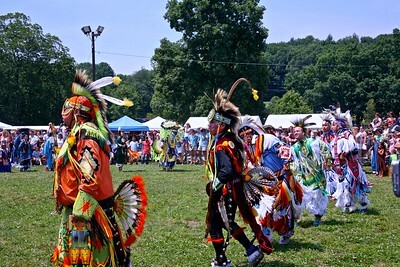 The Redhawk Native American Arts Council is a not for profit organization founded and maintained by Native American artists and educators residing in the New York City area. 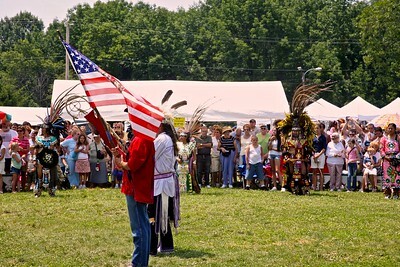 Since 1994, the Council is dedicated to educating the general public about Native American heritage through song, dance, theater, works of art and other cultural forms of expression. An Aztec Noble’s dress included symbols characteristic to their high social rank. Gold was used to adorn a noble’s dress and the use of feathers on head and robes were another accessory. The Aztec wore bright colors and the natural shine of tropical bird feathers. These feathers were plucked and then woven into beautiful designs or they were used for head dresses. 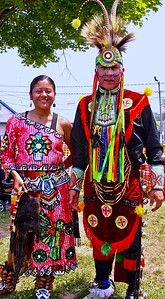 This Aztec gentlemen is visiting from Mexico and was about to perform Aztec dances at the PowWow. Golden Eagles are considered sacred within American Indian traditions, culture and religion. They are honored with great care and shown the deepest respect. 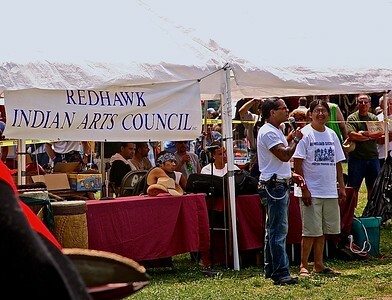 The purpose of the Redhawk Native American Arts Council is to educate the general public about Native Americans. It is a a grassroots non-profit organization . Addressing the crowd is Cliff Matais. He's the director / co-founder / organizer of the Red Hawk Arts Council. Though a lifetime NY'er (Crooklyn), Cliff's of Taino & Kechuwa roots & has been involved in Native American Indian Arts most of his life. This is one hard-working man! 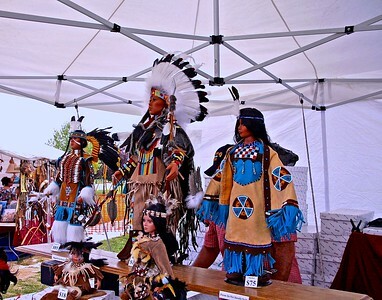 These dolls are dressed in Native American clothes and were presented for sale at the PowWow. Parents are delighted watching their children show enthusiasm learning about different cultures and participating in dances and music. The Redhawk message of respecting the earth, our elders and working hard to be the best you can be, is always a favorite with educators and parents. Tepees are tent-like American Indian houses used by Plains tribes. 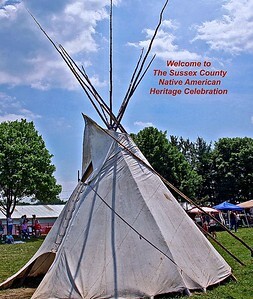 A tepee is made of a cone-shaped wooden frame with a covering of buffalo hide. Like modern tents, tepees are carefully designed to set up and break down quickly. As a tribe moved from place to place, each family would bring their tipi poles and hide tent along with them. Originally, tepees were about 12 feet high, but once the Plains Indian tribes acquired horses, they began building them twice as high. 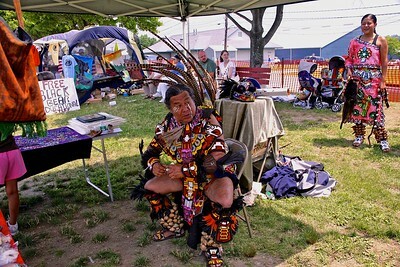 This is an example of man dressed for a fancy dance at this PowWow. Getting ready to performThis organization is attempting to break stereptypes of native Americans by presenting they traditions. 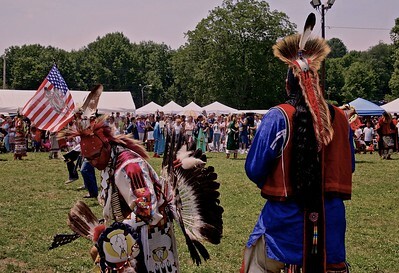 Since 1993, the Redhawk Native American Arts Council’s performing artists have been sharing Native American dance, music, art and history with audiences around the world. 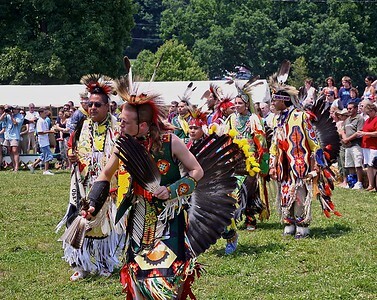 Our programs entertain, educate and foster a positive image of our nation’s first culture. 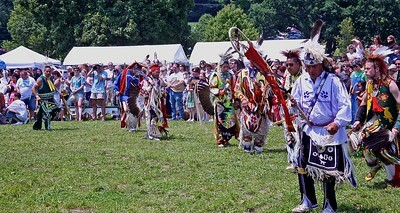 Drums provide the pulse of the pow wow. There is usually a host drum, consisting of up to eight men, and guest drums. 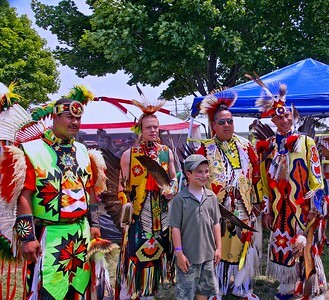 Drummers do not necessarily wear traditional regalia, they may just wear street clothes. 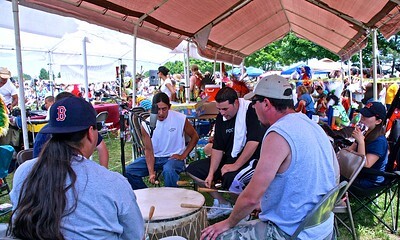 At outdoor pow wows, the drum groups are frequently under a tent as the drums have to be protected from moisture and temperature fluctuations. While the drum helps the dancers keep beat, it is the songs, and the range of pitches, that provide the melody the dancers focus on and meld their dance to. 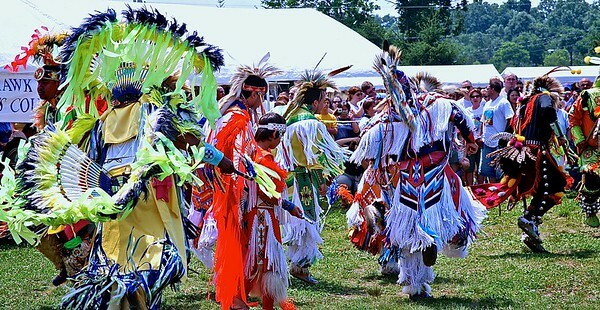 Grand Entry will be held before the traditional dances, at the start of each dance session. The Grand Entry will be led by the Veterans, who will post the flags. 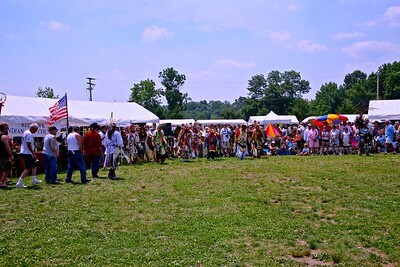 Eagle staff's traditionally are carried into the dancing circle by a native war veteran who has earned the respect of a member of the Pow Wow committee or an eagle staff owner. 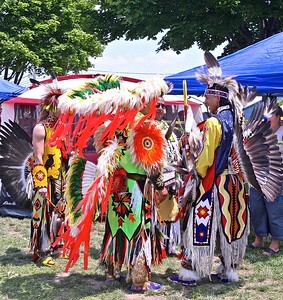 Pow-wow event begins with a grand entry by the dancers, after which the host drums inaugurate it with a special honor song.During the Pow Wow, many honour dances will occur. The dances are in honour of someone's special occasion such as birthdays, lengthy anniversary, the loss of a loved one and other honourable occasions. Usually a drum is requested by the family to sing a honour song. The family then would dance around once before the rest of the family members and friends join in the dance. 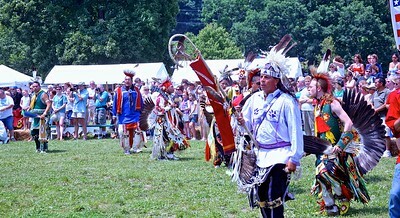 During the Pow Wow, many honour dances will occur. The dances are in honour of someone's special occasion such as birthdays, lengthy anniversary, the loss of a loved one and other honourable occasions. Usually a drum is requested by the family to sing a honour song. The family then would dance around once before the rest of the family members and friends join in the dance. 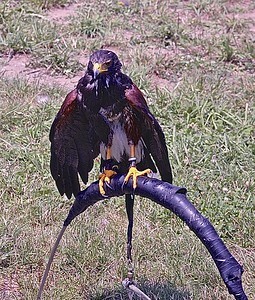 The oldest of the Indian symbols is the Eagle Staff. On the account of their warrior status, Dog Soldiers were given the honour of carrying the staffs. 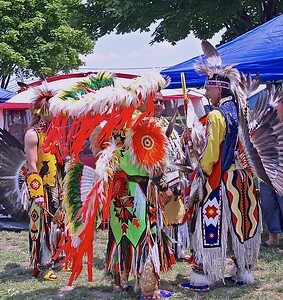 Representatives of the Oneida, Cherokee, Lokota, Shinnecock, Navajo, Narragansett, Taino and Aztec peoples were present at this PowWow. 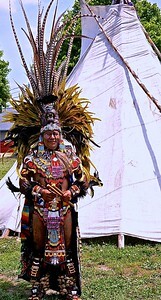 The Eagle Staff represents the stature and honor of a particular tribe or tribes. It commonly looks like a shepherd’s staff and is wrapped in either otter skin or buffalo skin, and exhibits eagle feathers (mainly tail feathers from a golden eagle) that indicate the Akicita honor of that tribe. Women traditional dancers usually dance in the outer edge of the dance circle bending their knees and staying in one spot. 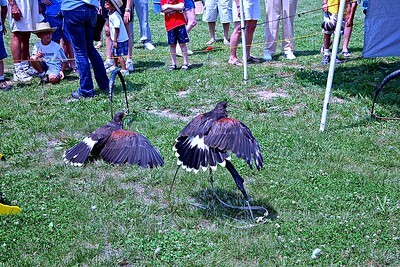 The men's fancy war dance originated in Oklahoma. These dancers are noted for their fast foot work, athletic ability and originality. The first of the traditional dances is always male dancers. 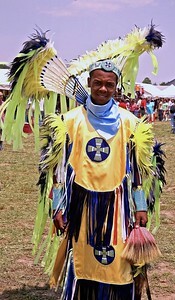 The northern dancers represent warriors scouting before or while they are on the hunt.